While bicycling can be a great way to keep fit, enjoy nature and get around, it’s also a competitive sport for people of all ages. But you don’t have to race as a professional in the big races, like the Tour de France, in order to engage in competitive cycling. You can do it right outside your door. In fact, in the Thurston County area, there is an active, amateur cycling team. 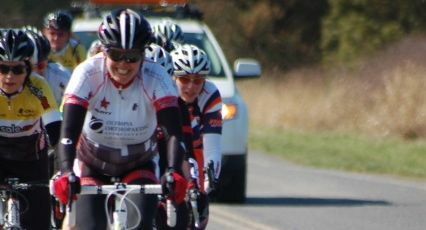 The Olympia Orthopaedic Associates (OOA) Cycling Team has its own races and also competes in events around the region. The team is organized to provide high-quality structure and support for amateur, competitive cyclists. The OOA team consists of many competitive disciplines including road, mountain bike, and cyclocross, which is a hybrid of mountain and road biking. It’s a fall and winter sport that involves doing loops of cycling, running with the bike, and leaping over obstacles in a set amount of time. The road biking discipline includes circuit and road races, time trials and criteriums. For example, a circuit road race brings together the high speeds of criterium racing with the characteristics of a road race. It is a repeated six-mile loop, which challenges riders with the course’s rolling hills profile. One of the team’s primary goals is to continue to grow the rider development program, which guides new racers in understanding and implementing race strategy and developing bike-handling techniques. However, what’s really special about the team is the growth of the women’s team. According to Michelle Kautzmann, one of the women’s team captains, more than twenty women signed up to race this year. “This year, we put more effort into building the women’s team through more extensive recruiting. We had three riders who joined because they saw the team advertised via flyers placed at gyms, coffee shops, bike shops, ThurstonTalk and the Capital Bicycling Club newsletter,” said Kautzmann. Kautzmann is also a co-owner of Joy Ride Bikes in Lacey. She said that the women who joined the team were evenly divided in different cycling disciplines. 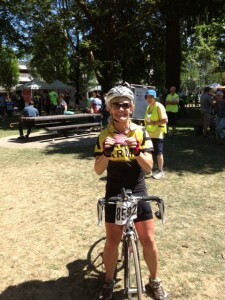 Cindy Medlin shows off her medal for completing the Seattle to Portland bike ride. The racers vary in ages and backgrounds and join for different reasons. 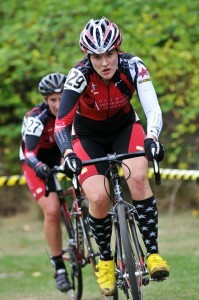 For example, new racer, Cindy Medlin, has competed in running events most of her life, but focused on cycling this year. “My co-worker, a local cycling event promoter and avid cyclist, invited me to an OOA team ride. After meeting some wonderful ladies on the team and being encouraged to join, I made the transition from inside riding as a spin instructor, to outside riding,” said Medlin. Oly Ortho team racer Colleen Welch leads the pack. 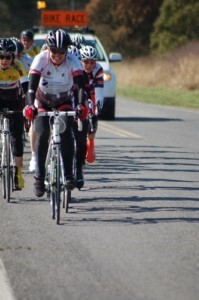 Additionally, long time touring cyclist, Colleen Welch also joined the team this year. “What I also love is the camaraderie of my fellow OOA Women Cat 4 racers. We strategize before each race and rejoice when our plan actually works! We have had some successes, but mostly, we have fun,” added Welch. In addition to OOA as the primary sponsor, the team is also supported by Joy Ride Bikes, Rosser Chiropractic, Beech Tree Woodworks, Adam Cramer, DDS, Pints Barn, and Dry Fly Distilling. To learn more about the team, click here.